Ethylene produced by plant tissues grown in vitro may accumulate in large quantities in the culture vessels, particularly from rapidly growing non-differentiated callus or suspension cultures, and hence is likely to influence growth and development in such systems. Research into this aspect of tissue culture has been sparse, although it has grown recently with the increasing importance of in vitro regeneration. This review deals with the measurement and relevance of the accumulated ethylene, and the influence of both exogenous and endogenous ethylene in the different types of tissue culture systems. 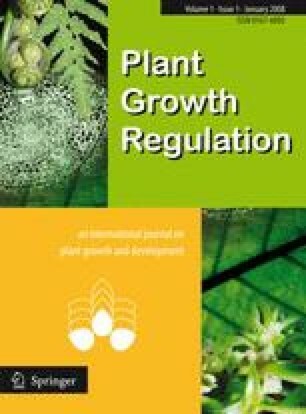 The relationships between ethylene and other growth regulators in tissue culture growth and development are also discussed. Although in some cases its influence seems negligible, in many types of tissue culture ethylene may act either as a promoter or inhibitor depending on the species used. Thus ethylene has an important influence on many aspects of in vitro regeneration, but it is also clear that we cannot at present describe a specific role or roles for ethylene in tissue culture which can be applied at a general, species-wide level. If its effects are to be enhanced or diminished in order to improve the efficiency and range of plant tissue culture, then more research is needed to clarify what its fundamental role might be in in vitro growth and development.